Sabrina Ward Harrison will be leading a workshop in Seattle, Washington on creating unique and very special visual journaling books. Join her as part of her True Living Project and let your creativity calmly burst. This workshop will be held at the Shuey House, Seattle, Washington. You will share meals, take outdoor nature walks, learn the true value of quiet, of listening, of writing and create freely with others. Sabrina will offer demos on collaging techniques, lead you through free writing, and the art of journal making and more. 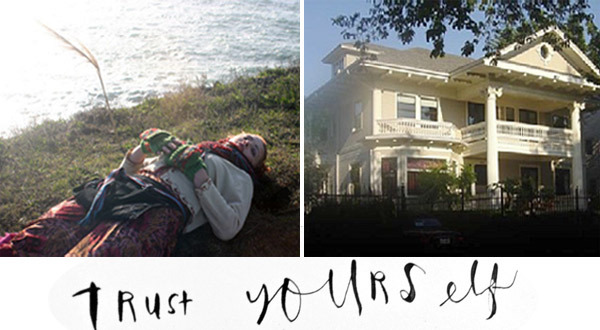 Sabrina began offering, “The Art of Becoming Yourself Workshops” 10 years ago by posting handmade fliers around her neighborhood in Berkeley, California. Over the years she has enjoyed traveling the world to facilitate her workshops with women and men who desire to create the life they most want to live. If you have a desire to restore, to get back to what is most real for you…join us. If you are longing to make a mess on the floor, to be enveloped by the creative process and to create the thing you most want to find… You are so welcome. Come, leave ripples with us. Art supplies (upon registration you will be sent a list of personal supplies you may want to bring. Tell Angela that Tango Diva sent you! Hello- I realize this workshop with Sabrina has finished but I am interested in future events. I live in Portland and am also a tango dancer! Might you know who organizes Sabrina’s workshops? Is it you?